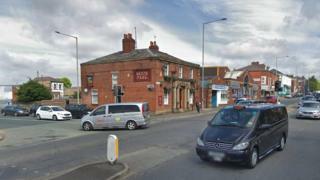 A cyclist suffered serious head injuries when he crashed into a wall while being chased by a would-be robber in Preston, Lancashire Police said. Two masked men riding a moped-style bike approached the 33-year-old victim at 20:25 GMT on Tuesday near Garstang Road's junction with Aqueduct Street. When he tried to ride away he was chased by one attacker before being pushed into a wall. One of the men searched him as he lay unconscious on the ground, police said. They left on the moped towards Aqueduct Street. The victim remains in a serious condition in hospital. Police have urged anyone with dash-cam footage of the attack to come forward.